Am I addicted or obsessed??? I can not get enough of yarn and crocheting and creating all manner of wonderful things. So much lovely, beautiful wool. 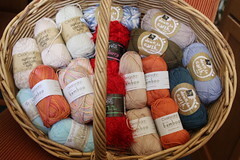 Actually, I think there's only 2 balls of wool in that lot, (and they're both Merino). With the exception of the 2 red balls (which are a bit of fun, I think I'll try and make something christmassy or even for decorating christmas presents with these), the rest are all either bamboo, cotton, or a combination of the two (with a bit of Soy thrown in for good measure). Yay! I've had a splendid weekend! Simon (as hinted at) has been skiing so I've had another weekend to myself. I got through all the necessary but tedious and boring chores early yesterday (washing is usually a late Sunday night event around here) and have proceeded to make stuff, tidy stuff, grocery shop (twice), indulge in a little impulse buying at the Warehouse - I was looking for a small infuser teapot, (no joy) and stumbled upon the most beautiful little green mini basins, single serve type mini (ie I don't think you'd even get a whole scoop of ice-cream in them), just so lovely! So 4 of them started wandering around the shelves with me, then within, ooh, half a metre, we (me and aforementioned mini basins) found some lovely little white, square low edged dishes. About 6cm square and about 1cm high edge. They leaped up and jumped underneath the mini basins and proceeded to enjoy the ride. On the way out I was captured by the praticality of command adhesive hooks - so they too came along for the ride, all declared themselves at the checkout, I paid the necessary fee and they have found themselves all comfortably at home in my kitchen and laundry. And now my broom and mop are tidy. Instead of falling on the washing machine and banging during the spin cycle, they are happily hanging from the wall. Good grief, that almost sounds like domestic bliss. Eep! So I've spent the last hour photographing my wool and a couple of crochet projects I hadn't photographed yet, uploading to flickr and then updating my Ravelry stash and projects pages, all while listening to Chill Radio on last.fm. In the glorious sunshine with a loving, loyal cat at my feet. The same cat who wrenched a blood-curdling scream from me this morning. Honestly, I was worried the neighbours were going to call the police! I was peacefully tidying up in the walk-in-wardrobe, and I knew Brulee was at my feet. I leant over to throw away a broken coathanger and next minute I felt this searing, shocking, terrifying pain in my ankle and leg. It was at this point that the involuntary scream was released, then I looked down and all I could see was Brulee attached to me by both claws and teeth! He scarpered, but then almost instantly came back to me. I'm not sure whether he was checking whether I still loved him because I'd stood on him or because he was desperately sorry for hurting me! It was very funny, but I expect you had to be there. I have to stop writing now. I think I've almost reached my limit of enjoying being on my own and am now using blogging as a way of fooling myself that I have company.